Companies that provide the intelligent support and engagement consumers expect reap the rewards of lower costs and higher revenue. But most organizations have not evolved their customer engagement strategy for today’s digital world. 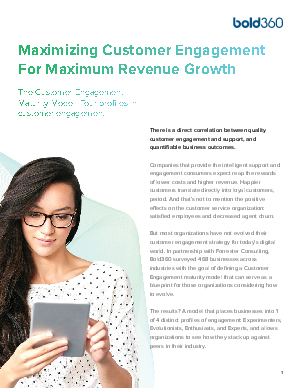 In partnership with Forrester Consulting, Bold360 surveyed 468 businesses across industries with the goal of defining a Customer Engagement maturity model that can serve as a blueprint for those organizations considering how to evolve.